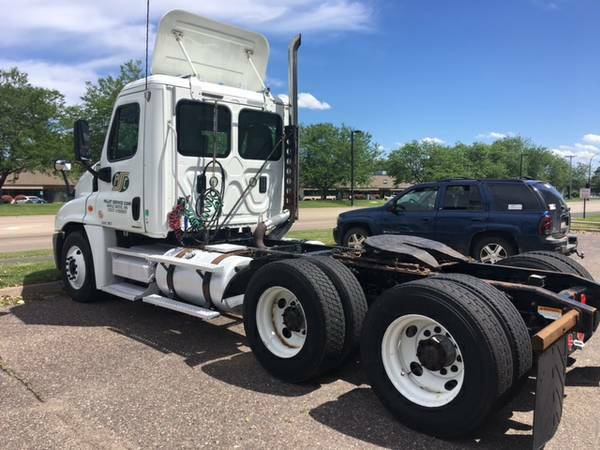 2011 freightliner cascadia 125 VIN: 1FUJGECK5BSAV9980 condition: excellent fuel: diesel odometer: 240000 paint color: white title status: clean transmission: manual 2011 Freightliner Cascadia 125 Day Cab; Detroit 455 H.P. 10 speed fuller manual transmission, air ride, two seats, Axles: Metitor front (12,000 lb) and tandem rear axles (40,000 lb.) White Elite Color, 184" wheel base, 22.5 tires (fronts new virgin) rears recap est. 50%, DOT until March 2018 VIN: 1FUJGECK5BSAV9980. $29,900 or best offer. Just received our new truck so this is available now!